Having suffered a major defeat at the hands of the Islamic State in northern Syria this week, the Assad regime is also in trouble from insurgent attacks in Hama Province in the center of the country. In the past month, the opposition has moved within a few kilometers of Hama Military Airport and Hama city, Syria’s fourth-largest. Well-placed sources reported on Tuesday that the regime is facing more difficulty because of the failure of counter-attacks. Having taken a series of villages to the west of Hama, the insurgents are now pressing Mhardeh to the northwest, attacking from three directions. Capture of the town would not only further isolate Hama city but also strength the insurgents’ line of control from Hama Province to Idlib Province in northwest Syria. The Islamist insurgency Jabhat al-Nusra has a prominent role in the attacks, with its leader Abu Mohammad al-Jowlani personally involved in directing operations. While pro-regime outlets have been raising fears of a religious assault on the town’s Christian population, insurgent sources assert that Jowlani gave orders to his fighters “not to abuse civilians or prisoners of war” and claim that “regime burned churches and mosques on their retreat and filmed it in order to blame rebels”. The head of the Syrian militia in Mhardeh told a Lebanese newspaper that insurgents are within 600 meters of the town, taking a regime checkpoint, and hit it with 100 shells on Sunday. 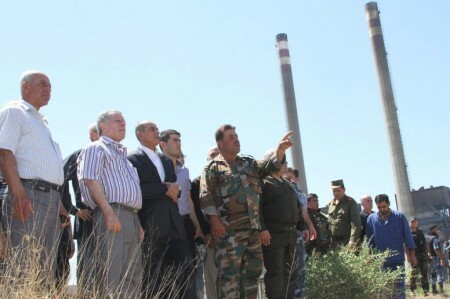 Meanwhile, the insurgent assault on Hama Military Airport continues, with Grad rockets continuing to cripple the use of the facility, vital for transport of troops throughout Syria, production of barrel bombs, and bombing runs.